(Newser) – "I didn’t realize the Wall Street Journal trafficked in warmed-over drivel from supermarket tabloids." That was how a rep for Amazon responded to the Journal when it requested an interview with CEO Jeff Bezos for what would become a piece titled "Jeff Bezos’ Journey From Private Family Man to Tabloid Sensation." The piece does sway into the gossipy realm, exposing a perceived schism in Bezos' life that materialized with Amazon's push into the world of TV and film. Even after becoming a billionaire shortly after Amazon's 1997 IPO, he kept things decidedly unflashy, at least per interviews: He upgraded a Honda Accord for a Volvo in 1999; in 2014 he said he was in charge of the dinner dishes whenever he was home. The full-court press into the entertainment industry came that same year, with the expansion of Amazon Studios into LA. Bezos and Buffet both need better tailors or fashion advisers. He should ditch that big knot tie from the 1970s. 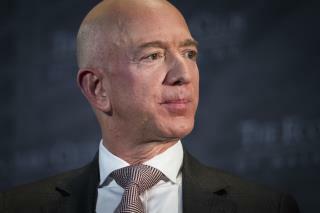 Bezos is no friend of the US; he is as degenerate as they come; boycott Amazon!.